Crossroads signs are one of those hallmarks of civilization, they are part of a universal symbolic language. We take them for granted but basically wouldn't live without them unless we carry a gps of course. To talk about signs we should first understand their nature, that is, what they are and how they signify. Greek philosophers defined significance as a relationship between two things, signs and the things they signify. One of the terms in the relationship causes another to come to mind. There are things which are not signs, things which are signs of other things and finally there are things that are always signs. Some act as signs whether we want it or not, like natural signs. Some others have to acquire the signification as is the case of signboards. Almost everyone would identify this post as a crossroad sign, almost every mentally healthy individual would understand which direction to follow. Many would notice that there is a color code combined with the size of the letters. Latin derived language speakers would interpret many of the words. And you can even imply that these are pedestrian only roads and that there is a subway station nearby. Did you see how easily do we communicate each other? Here is another idea to think about, one of the synonyms of crossroads is...crisis! But that is part of a different story. After a prop (on blip/fm, obviously) i'm very glad to leave this link (it's a post about Barcelona). maybe you'll like. -calma, I got the prop. Thanks! I read it. Grazie mile. Barcelona is quite similar, we are all Latin after all. As for the rest, I see you like philosophy. That helps a lot to get away from empty headed people. I understand perfectly. It's good reading. Thanks for suggesting the link. Send you a prop back. 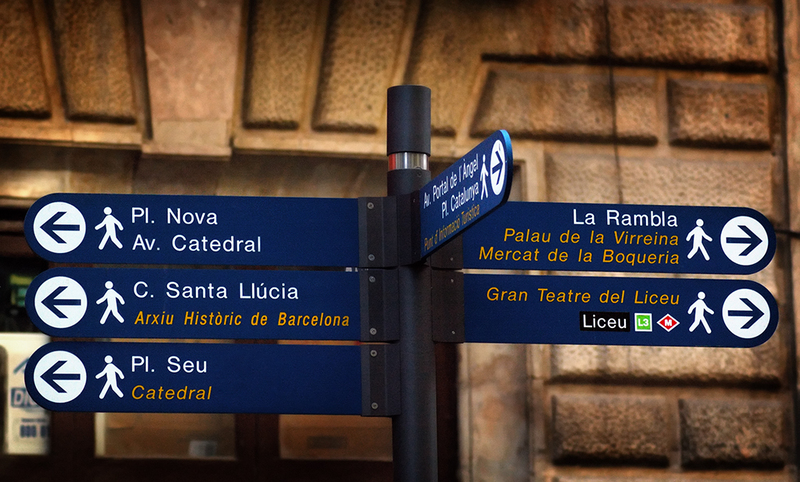 The signs in Barcelona are really different of others around the world, more modern. We always take pictures of signs, and this time we also got a great text to go with it!